In part 1 of the Gravity Forms - WordPress Contact Form Plugin Review we looked at the many features of Gravity forms. So if you're jumping into the review now please take a look at Part 1. In part 2 of the review, we're going to be looking at the various add-ons that are available for Gravity Forms. 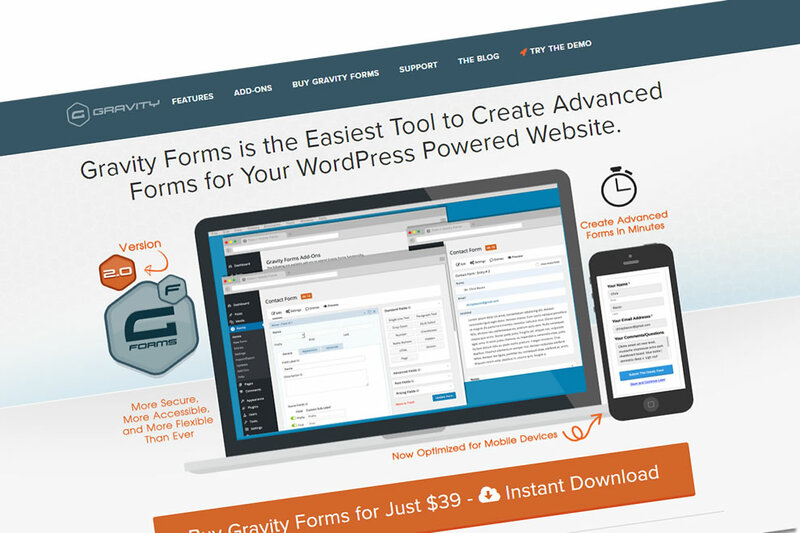 By itself, Gravity Forms is a pretty capable WordPress plugin for creating forms. These add-ons give you some extra functionality. The Gravity Forms AWeber Add-On will give the ability to integrate your Aweber contact forms for you opt-in email marketing campaigns, right in to Gravity Forms. You'll Collect be able to your subscribers to your email marketing lists automatically when a form is submitted. Gravity Forms makes it easy to integrate with your Campaign Monitor email marketing service with our Campaign Monitor Add-On. Collect and add subscribers to your email marketing lists automatically when a form is submitted. You love your monkey tools? Well then, use the Gravity Forms MailChimp Add-On and you'' get an easy was to integrate all of your online forms with the MailChimp email marketing service. Collect and add subscribers to your email marketing lists automatically when a form is submitted. The Gravity Forms GetResponse Add-On allows you to quickly integrate all of your online forms with the GetResponse email marketing service. Collect and add subscribers to your GetResponse marketing list when a form is submitted. Gravity Forms and Authorize.Net make collecting credit card payments quick and painless! With the Authorize.Net Add-On you can capture credit card payments along with any additional data you want from the user right on your site, without sending the user to a 3rd party to complete the transaction. FreshBooks integration just got easier with the Gravity Forms FreshBooks Add-On. Turn any Gravity Forms submission into a FreshBooks invoice or estimates and automatically create FreshBooks clients. Order forms are easy with the PayPal Payments Standard Add-On for Gravity Forms. Enable your users to pay you via PayPal Payments Standard as part of the Gravity Forms submission process. Gravity Forms makes collecting payments with PayPal Payments Pro quick and easy! With the PayPal Payments Pro Add-On you can capture credit card payments along with any additional data you want from your customer right on your site. The Gravity Forms Polls Add-On allows you to quickly and easily deploy Polls on your web site using the power of Gravity Forms. Easily add poll questions to any form! The Signature Add-On for Gravity Forms allows you to capture signatures online by allowing users to sign your forms using touchscreen devices, touch pads or mouse. Quickly and easily integrate signature capabilities into your forms. With the Twilio Add-On you can make SMS notifications a part of your form notification process by integrating with the Twilio SMS service. Get notified via a customizable SMS text message as soon as a form is submitted, or a payment is received via an order form. Need to quickly allow users to register on your WordPress site? The User Registration Add-On for Gravity Forms makes registering users a breeze. Are you looking for BuddyPress integration with custom profile fields? It does that too. Running a Multi-Site install and want instant site creation? We have you covered. And there are many more addons in the form of integrations available for Gravity Forms. Now my only complaint when it comes to the addons is their pricing schedule. Which you'll see below in the pricing for Gravity Forms. You can't just buy an addon by itself. Which really isn't a problem if you plan on using multiple addons. Except when you just need or want just one. I'm not going to tell you that Gravity Forms is the best thing since sliced bread. Gravity Forms works out great for us. With doing a large number of WordPress sites we need something that will let us make forms fast. And with the added capabilities we can justify the price. Time is something we don't have a lot of, so saving us time is worth it. The easy to use interface will let anyone make forms on their website. And best of all, no coding is required. Can you make forms for your website with the free plugins out there? Absolutely! Some of them are a little more complicated than other. But if you're looking for a form creating plugin that's easy to use, yet powerful then Gravity Forms might just be the choice for you. So thanks for taking a look at our review of Gravity Forms. Think Gravity Forms might be right for you? Click on the button below to get your copy today. And be on the look out for some reviews of the other contact form plugins with listed on our Contact Form Plugins for WordPress post.